"Both these images were the result of an attempt to capture some shots that are a little different from the more typical photographs that one sees of damselflies. The cool conditions meant that both these individuals allowed me to approach very close without flying off. 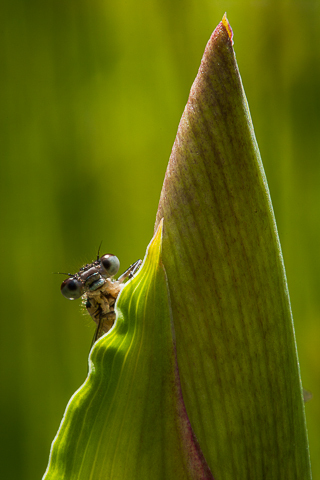 In the main image (left), the Iris flower bud on which the damselfly is resting creates a striking foil for the insect. I was very fortunate this iris bud is in such a mature state, only a day or so before it opens to reveal its striking flower."